The Caravan is just one more tribe traveling a post-apocalyptic landscape, foraging through the dead cities of the past. The tribe is friendly and well-adapted to the nomadic life. But there is something unsettlingly dark underlying the pleasantness. After months on the trail, they settle outside an abandoned city for the winter. Foraging teams go in, looking to fill their wagons with supplies. Meanwhile, a band of marauders watches. They have their own way of getting what they want. This time, however, they are in for a bit of a surprise. Audiobook edition available on Amazon, Audible.com, soon on iTunes. 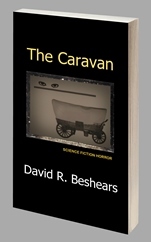 This novella is adapted from the post-apocalyptic scifi/horror screenplay "The Caravan", written by D.R.Beshears and registered with the Writer's Guild of America.